If you've always wanted to learn how to scuba dive, discover new adventures or simply see the wonderous world beneath the waves, this is where it starts! The PADI Open Water Diver course is the world's most popular scuba course, and has introduced millions of people to the adventurous diving lifestyle. The fun part about this course is...well, just about all of it because learning to dive is incredible. You breathe underwater for the first time (something you'll never forget) and learn what you need to know to become a certified diver. During the course, you'll make at least five pool dives and four dives in open water under the direct supervision of your PADI Instructor. In the PADI Open Water Diver course, you learn to use basic scuba gear including a dive computer, and standard accessories. The equipment you wear will be chosen by an Atlantis Aquatics Crew member to ensure your comfort throughout the course. After being personally fitted, each piece of scuba equipment will be explined to you, including the proper set-up, break-down and storage of your new gear. Here at Atlantis Aquatics we have a full line of quality equipment from multiple manufacturers, all priced competitively. During the confined water pool sessions, your scuba unit will be provided. Next, during the open water sessions, you will rent that same equipment, along with a wetsuit to keep you warm. If you would like to purchase your scuba equipment before the open water dives, you will not need to rent equipment. Diving with your own gear is the best way to get the maximum enjoyment from your training and first dives. 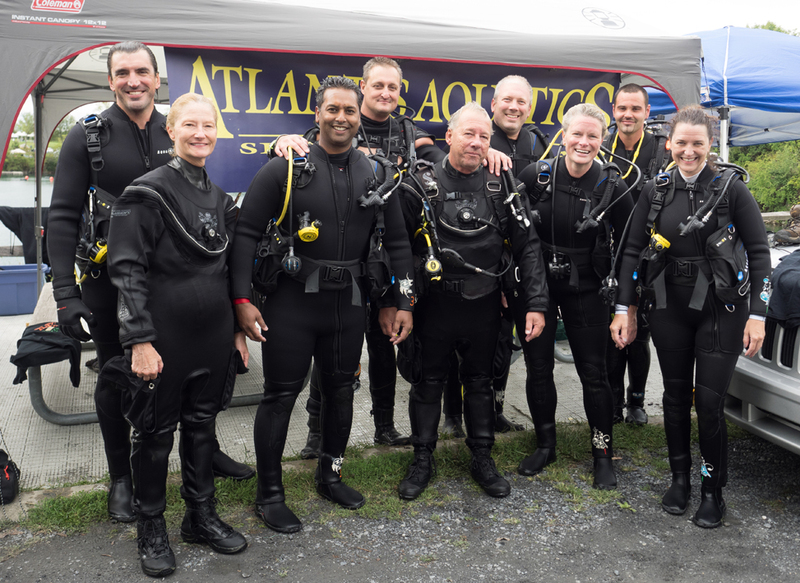 Atlantis Aquatics can make sure to match you perfectly with the gear that will serve you for years to come as your explore the wonderful world of underwater exploration. Be sure to ask us about gear specials when signing up for new class! We encourage divers to have their own equipment for maximum comfort, safety and reliability. If you do purchase during your class, you will receive a 10% DISCOUNT on any single item you select. Or for the best savings, purchase a Atlantis Student Equipment Package and receive a 17% DISCOUNT ! PADI offers a variety of home-study materials for the Open Water Diver course - book and DVD package or choose an online program in an eLearning environment via the internet. Scuba can be one of the most exciting things you will do in your lifetime, all you need is an eye for adventure and we can help you with the rest! If you will be traveling soon and would prefer to do your Open Water dives while on vacation, you can obtain a "referral form" from your instructor. Then you can start on vacation right where you left off with Atlantis. All PADI Instructors use the same exact training procedures to ensure your safe and consistant training. We do suggest you rent warm water diving gear from us to take with you, so you will ber sure to understand your equiment and be able to dive right into the fun! Maybe SCUBA is something you've wanted to do since you were young. Maybe someone you know got you interested, or maybe its on your "bucket list". Whatever your reasons and desires, don't wait for someday, make your someday TODAY! For more information about this class or other PADI courses, have a chat with your Atlantis Aquatics crew member.